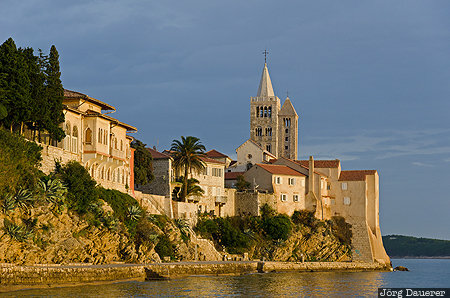 The center of the town of Rab at the coast of the Mediterranean Sea with its church towers illuminated by warm evening light. The town of Rab is on the island Rab in Primorsko-Goranska in the north-west of Croatia. This photo was taken in the evening of a cloudy day in November of 2014. This photo was taken with a digital camera.